This blog post addresses custom user interface testing in terms of functional test schemes that are completed prior to shipment. Generally, the first user interface assemblies shipment are for First Article acceptance testing where customers fully examine the first units for mechanical and electrical compliance to all engineering drawing and specifications. First Article Inspection (FAI) and verification occurs only once to qualify the first assemblies. Unless design revision changes are requested by customers, electrical testing for future ship lots will consist of functional testing. The rationale behind this approach is First Article or qualification testing addresses the product design plus manufacturing processes. Once the First Article unit is accepted, the qualification test of the design is complete. Subsequent shipped user interface assemblies do not require test to verify the design, only functional test is needed to assure the manufacturing processes and electrical functionality. Custom user interface functional tests are performed on each unit shipped by manufacturing personnel. Additionally, final inspectors audit a sample of the ship lot quantity to confirm the functional test results. Functional test schemes are divide into two user interface product groups. The first group is electromechanical interface assemblies comprised of a matrix of switches and may include discrete LEDs individually connected or matrix connected. The second group is electronic user interface assemblies comprised of switches and may include discrete LEDs, digital or graphic displays, control electronics such as a microcontroller and active electronic interface such as USB or other serial protocol, or bus interface. Typically two identical commercial computer-based programmable test sets are used for functional testing of user interface assemblies with switches and discrete LEDs. The test sets are programmed at the first use on a specific human-machine interface product. Once the test program is verified, the program is stored electronically for future use. The programmable test sets test all switches to verify open and closed resistance against thresholds, open and shorts in the user interface circuitry, tests discrete LEDs by measuring forward voltage drop when illuminated and visual confirmation for proper color by the test operator. The collection of tests performed results in a PASS or FAIL indication with any deviation from test expectation classified as a test failure. The test set provides the failure symptom on assemblies with a test failure. Epec maintains an assortment of standard connector interfaces used between the assembly under test and the test set. Occasionally, a new connector interface will have to be added when a new user interface design uses an unusual I/O connector. User interfaces with active electronics between the assembly's switches and the OEM's application require a different functional test scheme. In many cases, the functional test scheme will mimic the OEM's electrical interface to the user interface with additional test stimulation circuitry and a method of displaying test results. Besides the physical electronic interface needed to connect to the user interface, most electronic interfaces are encoded. For example, the test set must decode the data stream for an USB or other serial protocol to be useful for test purposes. 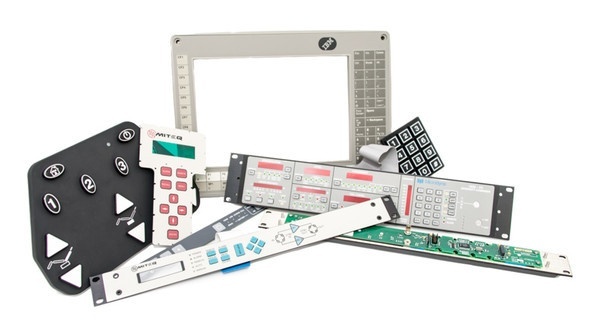 Development and custom built test sets that are unique to specific electronic user interfaces in a production environment can be created. However, developing and building a custom test set by the OEM may be a better solution. The OEM will be knowledgeable about the unique features needed in the test set because the OEM application will have the basis of the interface electronics already developed. All that is needed to complete the test set is a means to display individual test results for each switch function and a scheme to stimulate discrete LEDs or digital or graphic displays, if needed. It is important to recognize that the test set should not duplicate the function or form of the end application. The test scheme needs to be geared toward production testing the user interface, not the end application. Close communication between Epec and OEM designers is needed to work out the most efficient and capable test scheme before the test set is fabricated. If the OEM provides the test set hardware, it is further recommended that two identical test sets are fabricated – one for Epec to be used for final electrical functional test and one for the OEM to be used for verification test at receiving inspection. Experience shows that using two unrelated test schemes at both ends of the supply chain will cause future confusion if discrepancies are suspected. There are several other items concerning custom test sets that should be considered. Test sets will be used in manufacturing and inspection departments by manufacturing and inspection staff. The staff's safety and conform should be considered during test as production testing can be tedious. Little features such as the location and type of test controls as well as and positioning or holding the full assembly under test will reduce the test staff's fatigue. A common mistake made by test technicians or engineers who design and build test sets is overlooking test connector wear and ultimate connector failure. Standard electrical connectors are designed for a specific use that includes a specified number of connection/disconnection cycles. In an end application, a limited number of connector cycles before degrading or failure is rarely a concern. In the test environment, the test set connector wear may quickly exceed the rated cycles on the connector based on the production rate. The test set connector must be implemented in such a manner that the connector can be quickly changed when needed due to wear. A common solution involves a small test connector adapter cable or assembly. The adapter plugs between the user interface and the test set. When test connectors wear, the adapter can be simply unplugged and replaced to maintain test flow without interruption. Of course, replacement adapters must be maintained for this scheme to work. Functional test schemes are completed on all user interface assemblies prior to shipment. The style of user interface testing depends on the complexity of the UI. Early test planning during the user interface design phase is needed to provide suitable and reliable functional testing when they are first manufactured. Epec has the test experience and staff to handle customer's functional test needs and can assist OEMs in understanding test techniques and their own receiving inspection test methods.